Today it is hard to imagine that 120,000 Japanese Americans - more than half of which were American citizens - were forced, in 1942, to leave their homes and were put in concentration camps ("detention centers") in remote areas. And yet this is just what happened. Soon after the Japanese attack on Pearl Harbor the American authorities began to round up and imprison people whom they thought might be a threat to American interests. Many of these people were Japanese Americans. Then they told all the people of Japanese descent that they had to leave their homes and businesses. They could only take a few possessions with them and they were not told where they were going to be taken. This policy of securing "military areas" was fueled in part by the fear that members of the Japanese American community would help the enemy. People on the west coast were afraid that the Japanese would use contacts in the United States to help them bomb American targets. The policy was also supported by Americans who had racist views of the Japanese and who were glad to have an excuse to lock them up. The Japanese were hard working, and they often had successful businesses. 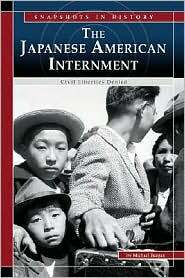 The anti-Japanese Americans resented this and were eager to have this productive section of American society removed. The camps where the internees finally ended up were grim places where the people had few comforts, terrible living conditions, and little hope. They worried about their family members and friends who were still in prison somewhere. They were angry that they had been treated with so little regard for their basic civil rights; and they resented the fact that they were not even given the chance to prove that they were good American citizens. In this excellent "Snapshots in History" title the author not only describes how the Japanese Americans were treated after the attack on Peal Harbor, but he also gives his readers a great deal of background information about the history of the Japanese living in America in the years leading up to this event. Readers will thus be able to understand how the resentment against the Japanese grew and why so many Americans were eager to have these poor people incarcerated. With numerous period photographs and boxes of interesting background information, this excellent title sets the record straight with regard to how the Japanese Americans were treated during World War II. The author gives an honest account of what took place, and he shows his readers how blurred the edges between right and wrong can become during wartime.